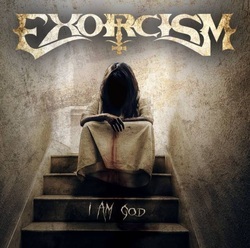 I Am God is the debut album of this doomy new metal supergroup of sorts that is spearheaded by legendary guitar shredmaster Joe Stump. The band has a very traditional doom sound with a strong helping of 90's era Dio in the mix (thanks mostly to the vocals of Csaba Zvekan of Raven Lord and formerly of Killing Machine doing the mic duties here. There is definitely Stump's stamp of guitar shreddery all over this CD, especially with the blazing solo work, but at the same time he seems to be doing fine stepping aside a bit and letting his bandmates shine through. Zvekan nailed the vocals on this CD, as the vocals are strong from beginning to end! What really grabbed my attention is just how much the bass really delivers the band's tone all throughout this CD. Bassist Lucio Manca (also of Raven Lord) seems to be in the spotlight on the CD more than usual and he definitely helps drive the whole project with his groovy fingerwork! No rhythm section is complete without a drummer of course and Garry King (who has worked with Joe Lynn Turner and Jeff Beck among others) holds down the kit here. Though the drums are not as much of a focus they are done with talent and precision making this offering a complete effort! I have said it before on reviews and will say it again here. Good metal is good metal and Exorcism is DAMN good metal! I find myself taking breaks from writing this review and just sitting back and taking in the music, despite it being the third time listening to the CD in it's entirety. Tracks such as End Of Days, I Am God, Voodoo Jesus, Master Of Evil, Higher, Exorcism and Stay In Hell are all classic tracks that deserve to be given ample attention. There really isn't any filler on this album and each song is definitely it's own message delivered with passion and skill! The band seems to revel in the mid tempo speed, with a slow and steady bass driving it along and Joe's guitar virtuoso soloing layered on top of it. The dual sound REALLY works! With bands such as Exorcism and a couple of other new doom projects such as Blackfinger and Blackwater coming out this year already, 2014 seems to be the year of Doom! You have been warned, now go out and get this CD! !